We’re entering week three of a new year. Maybe you’ve set some goals for yourself, some ‘New Year’s resolutions‘…. how’s it going so far? If you didn’t set yourself up for success right off the bat, you might be discovering that it takes a whole lot of gumption to actually do what you said you were going to do. Are you feeling… Disappointed? Uninspired? Unmotivated? Did you unknowingly expect your goals to magically come to fruition, just because you thought them and desired them to be true? Well, here’s your #truthbomb for the day: Goals are just dreams until you put them into action. The good thing is, goals can be set, and RE-set, at any time, not just January 1st. Would you like to start over? Well… guess what? Today is your lucky day because [insert today’s date] just happens to be the new January 1st! We all have ‘stuff’ that comes up. This is absolutely true. Road blocks, be them mental, emotional, physical, financial, work-related and/or relationship-related. And we get stuck… or even worse… stopped. However, it’s in our predicting and foreseeing of these obstacles, and how we meet them face to face, that can drastically alter the outcome. How resilient are you with respect to your road blocks and how often do you allow these obstacles to keep you from what you’ve set out to accomplish? Do you resent these set backs and resign to complacency? Or do you transform these road blocks into building blocks and grow through what you go through? How you handle set-backs largely affects your outcome, but let’s start from the beginning, shall we? One at a time, choose an area in your life to focus on. You’ll spend approximately 8 minutes in each area, spending 32 minutes total (4 areas x 8 minutes). BRAINSTORM. Set a timer for 5 minutes and write rapidly. If there was absolutely no way you could fail, what could you accomplish? Keep your pen to paper and let your ideas flow. Keep it simple. Don’t worry about the details, they will come later. Let yourself dream; be a kid. Be outrageous. Give yourself the freedom to explore what’s possible, with no limitations. SET A DEADLINE. Take 1 minute to assign a timeframe for the goal. How long do you expect it to take for you to get done what you want to accomplish? Setting deadlines will make these dreams much more real, and tangible. CHOOSE ONE PRIMARY GOAL. For 2 minutes, write down all the reasons you are committed to this goal and why is it’s worth investing your time. Why is this goal important to you? You have GOT to feel motivated and inspired by this goal, otherwise re-word it or change it altogether. Follow these steps and… CONGRATS! You’ve just set 4 one-year goals, one for each major area in your life! And now, here’s where you’ll take a closer look. With each one-year goal, break it down into achievable chunks. Determine short term, measurable steps that will bring you closer and closer to achieving your goal. Give yourself room to adjust as you set these steps in motion. Consider setbacks that could present themselves, and how you expect to overcome them. Be realistic and honest, set priorities, and track your progress. Ask others to help you remain accountable, and share with them when you achieve your goals. Above all, the most important part of goal setting is to celebrate your successes! No matter how small these accomplishments may seem, they are all part of the larger picture! You will one day look back and see how far you’ve come, and the effort required will have been well worth it! Grow through what you go through. This really does hold weight. 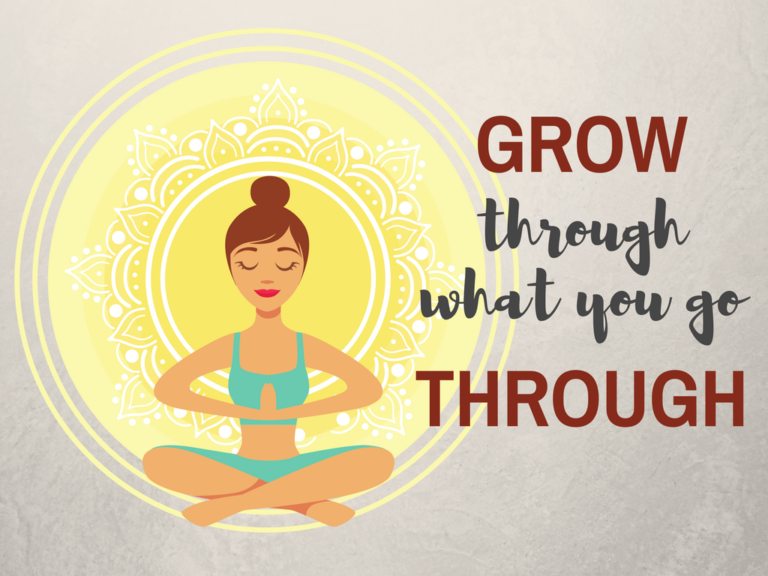 Every experience that is put in front of us is a new opportunity for growth and change. We can choose to accept these obstacles, and rise above them, or we can allow them to hold us back. You have the power to make your dreams a reality. Isn’t this so exciting? What kind of impact do you want to create in your own life, and the lives that surround you? Don’t be afraid to live large, and out loud. The alternative is dreary and sad and small – you are so much more than that. Everyone else knows it, and if you haven’t already, it’s time for you to discover it too!